The Grey Reef section of the North Platte is a standout tailwater with some of the largest trout in the United States. Regardless of the season, consistent water temperatures and abundant bug life make it a year-around destination. You’ll find that the seasons of the North Platte will cater to both your skill level and preference of presentation; be it streamer fishing, nymphing, or throwing dries—or a mix of all three elements. Single handedly the most underrated time of year and our guides’ favorite time to be on the water. Midges, scuds, leeches, caddis, psuedos and baetis emergences make for great nymphing. 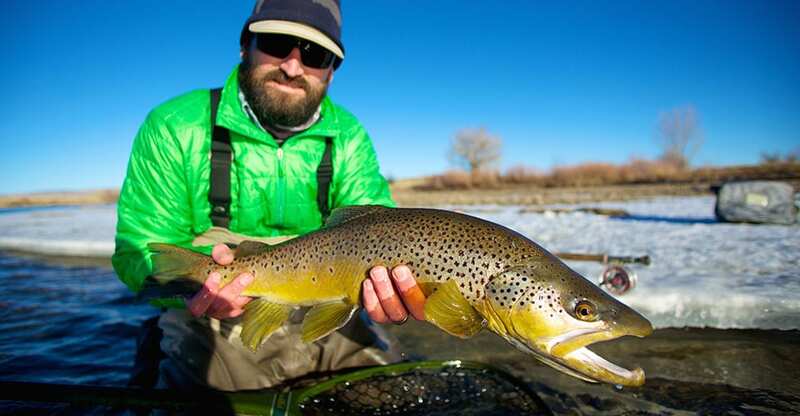 Streamers can also be hot, and dry fly fishing is some of the best of the year. Fall is a time when, in addition to summer, the big boys and girls come out to play. Most of the river’s large brown trout are caught during the months of September, October, and November. Cool, crisp, calm conditions and very little traffic make the late fall the perfect time to hunt North Platte River giants. Winter in Wyoming is historically known to bring both the wind and cold. Regardless, intermittent periods of warmer, calmer weather patterns provide some tremendous fishing, minus the springtime crowds. Wintering fish feed on a mix of midges, scuds, and leeches, making for productive nymphing. But let it be known, DO NOT rule out the streamer fishing, just make sure you compensate for the colder water by SLOWING your presentation. Over the past few years, winter has become one of our favorite seasons for streamers. Throwing 6 to 8 inches of articulated feather and fur can produce monsters. Grey Reef sees some impressive midge hatches during this winter window too, yielding some surprisingly good dry-fly fishing. For those anglers interested in waterfowling, The Reef Fly Shop and North Platte Lodge offer both great hunting and fishing packages this time of year. This is the most talked about time to be on the Grey Reef. Clear and low water conditions bring people from all around country (and world) to witness some amazing trout fishing. Midges, scuds, leeches, egg patterns, and baetis make up the trout forage in the spring. Increased river traffic dictates lighter tippets and a slightly more educated presentation during this time of the year. While not the most productive streamer fishing numbers-wise it has given up the goods: huge browns and slab-ish ’bows. The spring offers great dry-fly potential during the large baetis hatches customary of this river. Water raises and traffic dissipates, and fishing, in our opinion, gets more exciting. Scuds, leeches, PMDs, yellow sallies, tricos, crayfish and caddis make the summer the most insect-diverse time of year. Typically our guides find themselves traveling to all reaches of the North Platte to enjoy what summer has to offer. Increased vegetation creates structure for the big boys, so stripping streamers or nymphing along the weed beds produces results. Catching fish on dries, nymphs, and streamers—all in the same day—is not uncommon in summer. Most people prefer pursuing the larger fish with streamers, which can also be exciting.